A charming bakery cookbook with 85 southern baking recipes for favorites like cookies, cakes, pies, and more to make every day delicious - from breakfast to dessert. 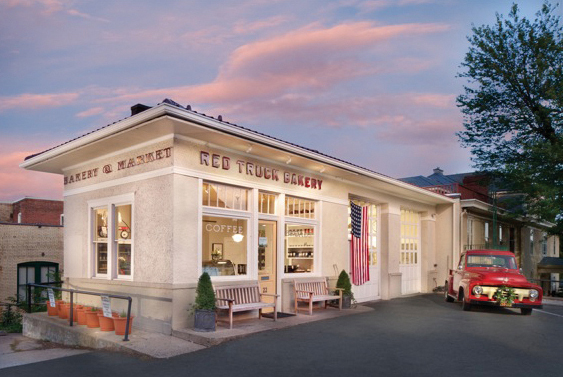 Nestled on Main Street among the apple orchards and rolling hills of rural Virginia, Red Truck Bakery is beloved for its small town feel and standout baked goods. Red Truck Bakery Cookbook is your one-way ticket to making these crowd-pleasing confections at home. Full of fresh flavors, a sprinkle of homespun comfort, and a generous pinch of Americana, the recipes range from Southern classics like Flaky Buttermilk Biscuits and Mom's Walnut Chews, to local favorites like the Shenandoah Apple Cake and Appalachian Pie with Ramps and Morels. Between the keepsake recipes are charming stories of the bakery's provenance and 75 gorgeous photographs of evocative landscapes and drool-worthy delectables. It started when John Wayne made me a tuna sandwich. And then I bought an old red truck from fashion designer Tommy Hilfiger for my farm. After 30 years as the art director of The Washington Post, and Smithsonian, Architecture and Preservation magazines, I ditched it all to open a rural bakery out in the Virginia Piedmont hunt country an hour west of DC. We're now getting a lot of attention from The New York Times, Garden & Gun, Esquire, Southern Living and many other publications. President Obama has a thing for our baking ("I love pies. That's not a state secret. And I can confirm that the Red Truck Bakery makes darn good pies.") . We ship thousands of items nationwide each year from our southern bakery in the middle of nowhere. Did I mention double-chocolate moonshine cake with real Virginny hooch?